The Work column has two areas. The top area has links to the New and Open commands in AutoCAD. You can get right to work by opening a file or by creating a new one. There is also a link to Open Sample Files. These are the sample files that come with AutoCAD. The lower area is a list of recently open files. Nine files will be listed here. The middle column is the Learn column. It has links to video tutorials. 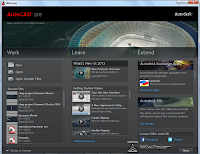 The top link takes you to a What’s New in AutoCAD 2013 video. The other videos are Getting Started tutorials. They show you how to use help (yes there is a Help for Help and it needs it), create objects, do some 3D work, and several videos highlight some of the newest features. At the bottom of the column there is a link to other online resources from AutoCAD. The Extend column takes you to the cloud. (I told you there would be a trip to a magical place.) Autodesk has created the Autodesk Exchange App Store. Here you can go and get apps to use inside of AutoCAD. The App store was introduced late last year and is now integrated into AutoCAD 2013. You can also access it through AutoCAD 2012. Autodesk changed their app store access from being locked down to only AutoCAD 2012 into a brand new website. 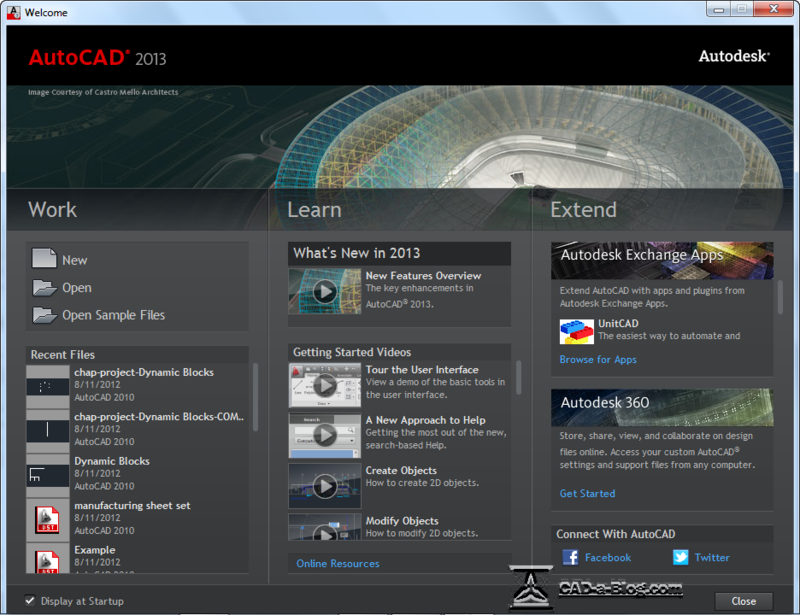 Anyone can go there now through a browser where there are apps for several Autodesk 2013 titles, not just AutoCAD 2013. Autodesk 360 is a cloud-based service that will allow users to access and share files through the cloud. It is a free service provided by Autodesk. If you are a member of Autodesk subscription services then you get more services. Essentially Autodesk 360 is a place to upload your files and share them. There are also mobile applications for tablets and smartphones that allow you to access and edit your files stored there. AutoCAD 2013 also has Autodesk 360 interaction built into it. You can save, upload, download and share files in the cloud through AutoCAD 2013. The last panel provides links to Autodesk’s social media accounts on Facebook and Twitter. The AutoCAD 2013 Welcome screen isn’t revolutionary by any means, but it may be a tool that you want to use and visit from time to time. It provides access to helpful bits of information as well as provides links to communication tools.